You and your Rottie can find a compromise to prevent bloat. While you may feel bloated like a hot-air balloon ready to explode after eating at your favorite Mexican restaurant, bloat in Rottweilers is a serious issue that needs to be taken seriously. Unlike in humans, bloat in dogs won't "disappear in thin air," but fortunately this condition can be prevented. A little bit of a distended tummy after a heavy meal may seem like no big deal in humans, but in dogs things are much different. Should your Rottweiler ever bloat, his stomach will likely fill up with air and put pressure on important organs and his diaphragm. To makes things even worse, when the stomach is bloated, it may "go for a spin" and twist, with the end result of cutting off the blood supply to the stomach and spleen. Bloat can virtually affect any dog, but it seems to have a preference for large and giant breeds with deep, narrow chests. Unfortunately, the build of the Rottweiler makes him fit the bill. However, this lovely black-and-tan breed is fortunately way down the list of breeds at risk, ranking at spot 23 with a 1.1 percent increased risk for developing bloat compared to a mixed-breed dog, according to a study conducted by the University of Purdue. However, this does not mean your guardian dog should let his guard down when it comes to this serious ailment. While you may just develop a bloated belly, double chin and puffy face after a binge, your Rottweiler may develop much more serious symptoms. Keep an eye for restlessness, pacing, distended abdomen, rapid breathing, drooling and non-productive retching. Ignored, these symptoms may progress quickly causing your Rottweiler to develop a weak pulse, pale mucous membranes and a rapid heart rate, which may lead to shock. 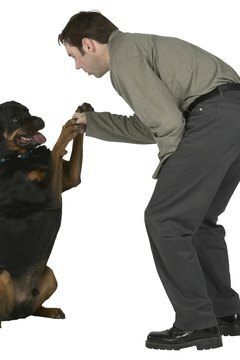 For this reason, it is of paramount importance to have your Rottweiler see his vet at the very first signs of trouble. Battling belly bulge in humans is pretty straightforward; take a couple of Tums and let the air flow from an outlet of choice. 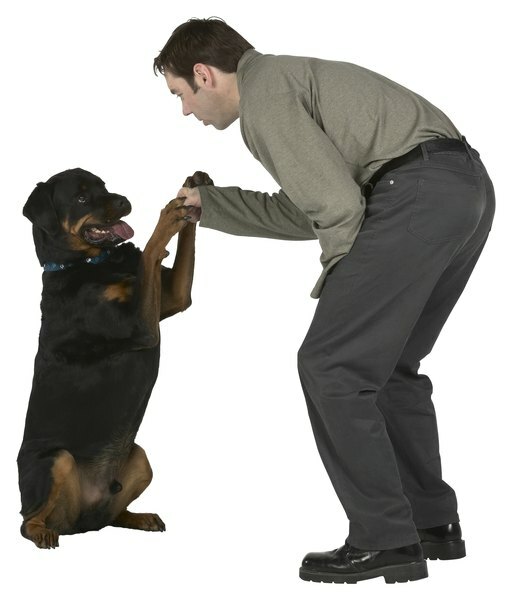 When it comes to your Rottie, the sooner he is seen the better the prognosis. Generally, his tummy is deflated by passing a stomach tube or inserting a large needle into the stomach so to release the trapped gas. Should the stomach be twisted, then surgery must be immediately performed. While in humans a case of bloat quickly becomes boring as yesterday's news, in Rottweilers it may have a dire impact, even when treatment is sought. At least 35 percent of dogs with gastric dilatation and volvulus die despite the fact they were treated, explains veterinarian Joe Bodewes. As much as this sounds like bad news, the good news is that a lot can be done to prevent your pampered Rottweiler from getting bloat in the first place. A good place to start is by posting a speed limit to your Rottweiler's eating. Wolfing down a meal as if he hasn't eaten for years will cause him to ingest excessive air. Try feeding smaller meals frequently over the course of the day, instead of one big meal. Limit water consumption after feeding and avoid vigorous exercise, excitement or stress for at least two hours after feeding. Also, prevent your Rottie from consuming large volumes of water after exercise to prevent gastric distention, according to the Merck Veterinary Manual. And don't forget to keep food locked and out of reach: your Rottweiler may go on an all-you-can-eat buffet and get bloated from eating too much food. Does the Scent of a Candle Affect Pet Parrots?